The 112'/34.38m motor yacht, Seafarer, has been listed for sale by Raymond Young at RJC Yacht Sales. Delivered by Westport in 1999, she underwent refits in 2013 and 2015/2016. Built with a GRP hull, superstructure and deck, she boasts exterior design by Jack Sarin and interiors by Sheryl McLaughlin. She easily accommodates up to eight guests in four cabins, with a crew quarters for four. The master suite boasts a walk-in cedar-lined wardrobe and an enviable private bath that features Crema Marfil marble, complete with large whirlpool bath, His and Hers basins and a central shower. Her spacious main salon has a large sofa along one wall, complete with coffee table and armchair, a wine chiller and a seated granite-topped bar with a sunken floor opposite. The salon also has a large television and a formal dining area. Additionally, guests can relax on extra seating in the pilothouse. Her flybridge has a Jacuzzi, lounge area, and seated drinks bar, while her aft deck has an al fresco dining table within a U-shaped sofa. 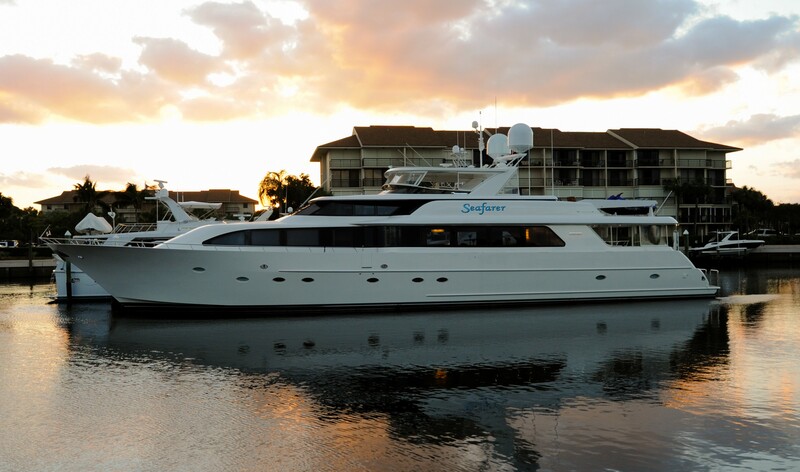 Currently lying on Fort Lauderdale, Seafarer is asking $4,200,000.